By request, we have re-designed our control box to include a protected circuit board to ensure it is moisture and vibration protected. It is smaller in size than the standard control box previously provided and has four mounting locations with rubber feet to prevent any disturbance while underway. The display panel works on a “phone cord” concept. The Mermaid units still have the 4 foot “pig-tail” harness for ease of installation and remote mounting the electrical control box. The standard thermostat cable length is 15 feet. Longer is available upon request. Have an older unit? No problem! 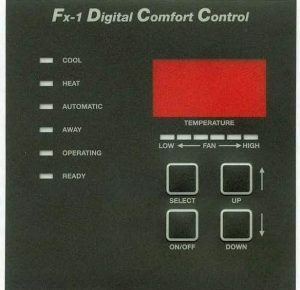 Older Mermaid units and other marine air conditioning products CAN upgrade to this new model thermostat within minutes. Removal of the prior electrical box, reversing valve coil (on Cool/Reverse Cycle Heat units) and thermostat are the only required modifications!